My oral surgery is finally all done. After six months, a dozen appointments (some stretching as long as six hours), significant (but appropriate) use of painkillers, and more money than I like to think about, I have a brand new smile. With teeth that stay in my mouth and do what teeth are supposed to do. Hallelujah! I will admit to more than a little trepidation before and during this long process. Because of the car accident 22 years ago that started this whole mess, I've become fairly familiar with multiple dentists, other dental professionals, and dental offices. I certainly don't get nervous about a simple cleaning or even a filling here or there. (Good thing, too, since I have to go back next month to have a couple done!) But this extensive process was several steps above normal and I was, frankly, nervous. So, to alleviate my concerns I read--Standard Operating Procedure for me. I always had a book in hand at each appointment so every free moment I could dive into the written word and get my mind off of the injections and grinding and mold-taking and other fun and games I was experiencing. For the two interminable appointments, six and four hours long respectively, I needed to be reminded of just how grateful I should be for modern dentistry. 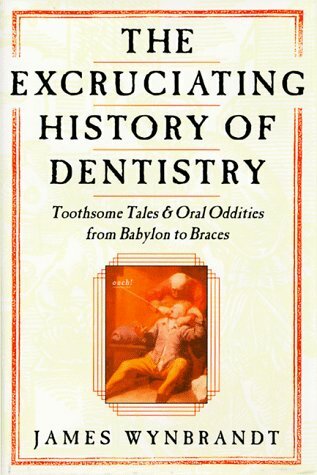 I had to pull out the big guns, and The Excruciating History of Dentistry was it. Mr. Wynbrandt starts chronicling the history of humankind's dental woes in the ancient world. I'm grateful that we don't still believe that little maggots in our mouths cause cavities and that we don't use a large blunt object to knock out troublesome teeth. I'm beyond grateful that we've moved past using urine as a "medicinal mouthwash." Wynbrandt states that in Rome during the first century A.D.,"the first urine of the morning was advised as a medicinal mouthwash and the urine of young boys was considered best." All together now...Ewwww. I learned of some interesting literary contribution dental practices made to the vernacular. Medieval criminals were sometimes sentenced to tooth extraction - specifically of the upper incisor and canine or "eyeteeth" - as punishment for their crimes and so, "the trade-off between possible illicit gain and potential tooth loss was always at the top of their minds when planning a caper. thus, objects of great desire ultimately were referred to as things for which one would gladly give an eyetooth." Shakespeare himself mentioned teeth in 35 of his 37 extant plays. I'm grateful that dentists today are thoroughly educated and credentialed. For a good portion of history, dental work was performed by "a variety of unqualified people from unrelated professions" including barbers, butchers, and an alarming slew of quacks and charlatans. Of course, this led to an abysmal success rate and a shocking number of deaths. "London's weekly Bill of Mortality of August 15-22, 1665, recorded 5,568 fatalities, with "Teeth" holding the no. 5 spot on the chart. Take out the 4, 237 dispatched by the plague (the no. 1 killer of the week), and the 111 souls who succumbed to complications from dental procedures accounted for almost 10 percent of all deaths. Most died from 'mortification'--infection--that set in after botched operations or as a result of unsanitary practices." It struck me over and over again reading this book that before the mid-1800s when nitrous oxide and other painkillers (including opium, cocaine, and other substances no longer in use), a vast swath of the population must have lived in constant pain and, likely, fear. That abscessed tooth sure hurt, but having it extracted without anesthesia would hurt, too. And then after words, it was very likely to get infected and hurt all the more, perhaps even kill you. The blessings were getting easier and easier to count. Disgust triumphant came, and love expired!" This book helped me power through the last of my extensive dental work, replacing the apprehension with overwhelming gratitude for living when and where I do. I have access to competent, trained dental professionals who use sterilized equipment and anesthesia. And I don't gargle with my sons' pee. Life is good. Thanks for the info, I will be checking in..good stuff...thanks again.